We will not pamper you, but we will try and make feed stops memorable, by both their substance and their location. 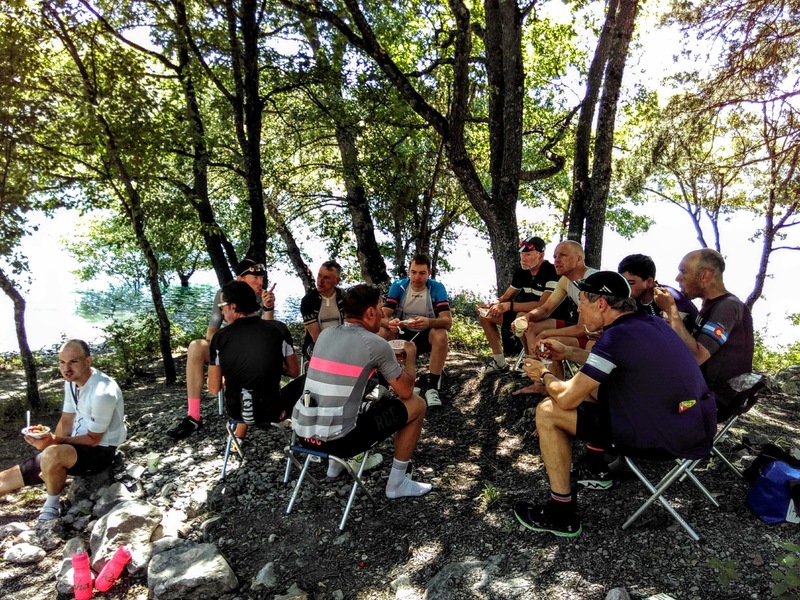 We will help you focus on the cycling by taking care of as much as possible, but in the mountains riders need to be ready to look after themselves, and each other, at times too. For navigation, we use gpx files, stage-by-stage pocket route sheets and the maps.me app. Riders receive top-tube stickers with the stage profile. GPS Garmin links are supplied allowing the route to be downloaded in advance. The use of Garmins is highly recommended. Briefings are held each evening presenting the following stage, emphasising particular difficulties. Support cars on the road are manned by the event personnel ; the number of staff/vehicles depends on the size of the group. Two roadside feed stations (under cover in bad weather) are set up each day. Drinks and light snacks are provided here, as well as energy bars & gels. Savoury and sweet to suit all tastes. Baggage is transferred from hotel to hotel..
Limited space in vehicles is available if a rest or medical attention is required. Comprehensive pre-event guidance to help you prepare for all aspects of the event, not just the pedalling, is given over the months leading up to the Challenge. Breakfast and evening meals are provided in hotels. Your support was the best I have ever had…on an organised sportive event. Thank you. What can I say - best ever experience in life not just in cycling.